As a teenager Growin’ Up in Maine, and like most, there was one thing I dreamed about. You could successfully argue there are a lot more dreams for any adolescent; and fantasies excluded, I’m talking about a driver’s license. 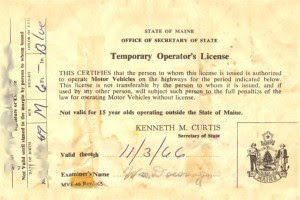 The scanned graphic shown is a 2008 discovery of my 1966 Maine State Temporary Operator’s License found this month during long overdue spring cleaning as mentioned in another story. The license expiration date is shown as Nov 3, 1966, so as I recall this was to allow a person 6 months time to get the permanent one. The learner’s permit was likely a year earlier after completing Driver’s Ed at Milo High School, and I strongly recommend parents have their teens take a driving course. My wife and I have each driven over 40 years without an accident, not counting my minor incident navigating my sister’s ’58 Chevy into a swamp on Ricker Road, or spinning donuts with my brother’s ’65 Mustang into a snowbank on Derby Hill during a blizzard. Full confessions may follow, but not today. Instead, I want to focus on that driving class and the joys of sitting in the backseat while a novice driver finds out why the teens are the awkward years. Being from a small town with mostly two-lane highways and no stop lights, we hit the big city and tried out one-way streets in Old Town. Later we braved traffic lights and divided highways in Bangor. Thank God for the extra brake pedal on the teacher’s side of that car! He was a bit slow on the Brownville Road as one classmate nailed a dog she sent spinning to doggie heaven. All in all the excitement was good material imprinted on the brain for a lifetime of safe driving. Hope I haven’t jinxed it. Finally, as an afterthought I blurred the signature and birthdate in the illustration to obscure details. I’m not looking to attract birthday greetings or anyone after a new identity.